The AR-15 was considered by the New York Times to be “the most wanted gun in America,” and with good reason. It’s incredibly popular for its light recoil, comfortable ergonomic design, and availability. But for many AR-15 owners, the biggest draw is the AR-15’s modular design. The wide range of customizable options make it popular for people interested in gun mods. One of the most-bought modifications for any AR-15 is the scope mount. This article will look at a few different scope mounts and cover what to look for in a new mount. When looking for a new scope mount there can be dozens and dozens of different styles and brands. But not all scope mounts are created equal. Just because it’s cheap doesn’t mean it will be the best. 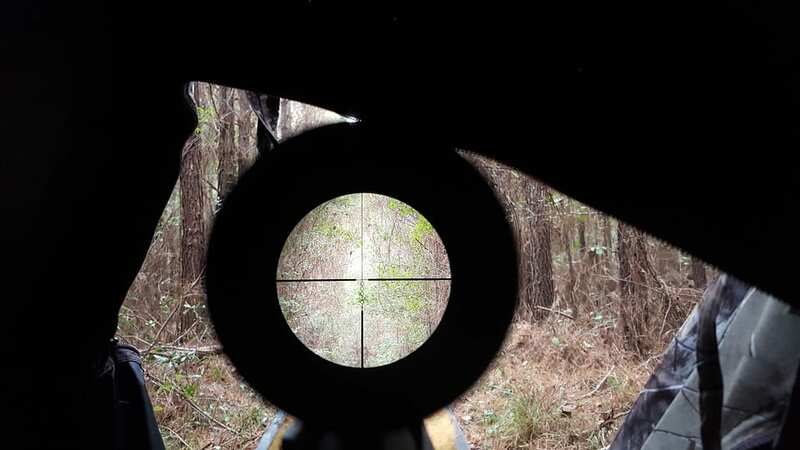 A cheap mount is more prone to breaking, coming out of alignment, or even damaging your gun. The main things you’ll want to consider when picking a scope mount for your AR-15 are durability, construction, features, value, and how the scope fits your needs. Durability is obvious since everyone will want a scope mount that doesn’t need to be replaced every month. But it’s worth considering how often you use your AR-15. Maybe you only use it once or twice a month at the range and keep it locked in your gun safe otherwise. In that case you may not need to shell out for the super-expensive, super-durable models. If you’re keeping your AR-15 on you for daily use or transporting it out of a case, a more durable scope mount is good to prevent it coming loose. Construction is another consideration. Do you prefer certain materials? Is the scope you use shorter than most “standard” scopes? Is there a particular laser sight that you’d like to mount? Do you change your scope often? These sorts of questions should all be considered when picking your scope mount. As far as features, scope mounts aren’t going to be as widely customizable as the AR-15 itself. But there are still a few options to consider. There are quick-release levers (QD), and some mounts will fit laser sights and other add-ons. Value is another contestable element when buying a scope mount. Just because a scope mount is cheap doesn’t mean it’s bad (or good). Just because a scope mount is expensive doesn’t mean it’s the best option for you. How often you use your AR-15 and what features you want help determine if it is worth the price. And finally, determining whether a scope mount fits your needs is important. I’ll discuss more of the challenges of picking a mount in the next section, but what the “best scope mount” comes down to is your own needs. There are objectively great scope mounts on the market. But the best, most durable scope ever can’t help you if it won’t hold your oversized scope or fit the laser sight you want. Unfortunately there is no one-size-fits-all solution. There are a few mounts on the market that do their best to fit many styles and sizes of scope. Some mounts are available with adjustable lengths and a few other bells and whistles. These features allow them to accommodate more than one type of scope. But there are too many factors for any one mount to fit every type of scope. 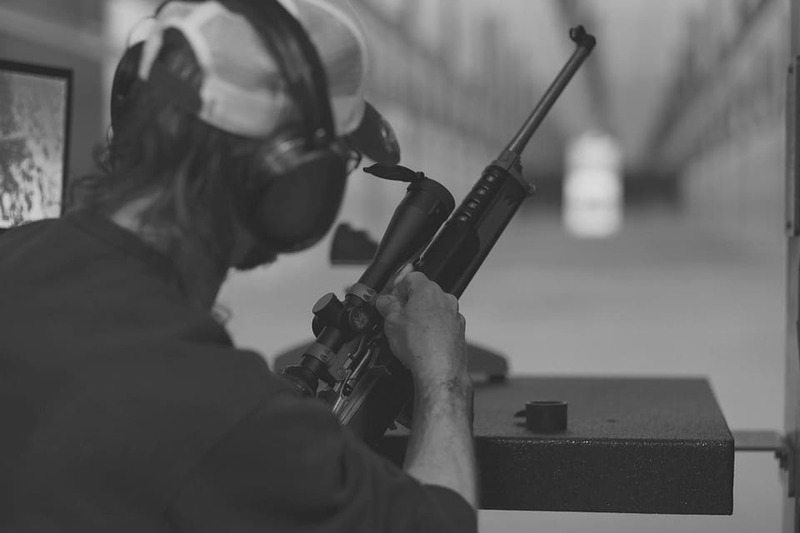 The biggest factors you’ll need to adjust for are the types of rails your AR-15 has, and the width and length of the tubes on scopes you use. There are a few other considerations, but those will be the brass tacks for whether a scope will work for you. As far as rail styles, most AR-15s are equipped with Picatinny rails. But some users may opt to have M-LOK or Keymod rails installed for one reason or another. 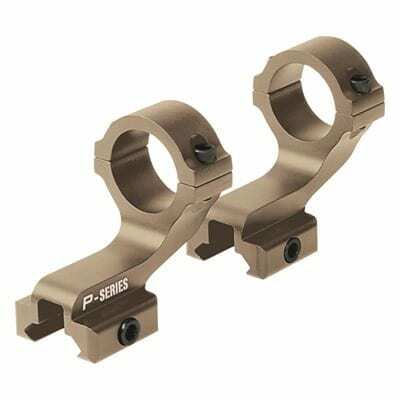 The majority of the scope mounts we’ll look at are compatible with Picatinny and other flat-top rails. Every scope mount seems to have a different way of addressing scope width and length. Adjustable-length mounts are much more common than adjustable width. It’s best to approach your scope-mount shop with an idea of what scopes you’ll intend to use. With a specific reference point, picking a mount that works for you will be much easier. I selected these mounts for their popularity, their quality, and, in my opinion, their value. Each of these represents a few different options you may have for your scope mount as an example of what’s out there. This is far from a complete list of what’s out there, but it’s a great place to start and represents some of the better options. 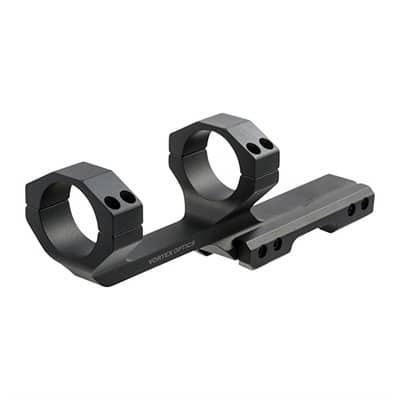 The American Defense Recon-S No Offset Mount has a lot of great features for its price. It's a bit more expensive, but it's got some great features, like quick-release rings. Snug, no-slip fit on Picatinny rails even under heavy recoil. The Vortex Sport Cantilever Mount is a great cantilevered sight mount. It's designed to accommodate correct eye relief and head placement. It’s got a lightweight aluminum construction and fits a couple different tubes sizes. The Burris AR-PEPR is my go-to budget scope mount. It’s got great adjustable features and doesn’t sacrifice durability for cost. 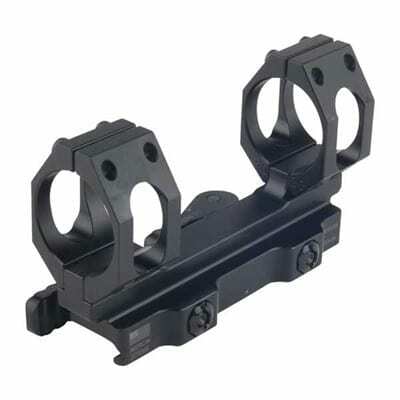 Sights in this mount may come out of alignment with improper or continued usage. The CCOP MNT-1516 is another good budget scope mount. It is comparable to the Burris scope mount at a slightly lower price point, though it does have drawbacks. The Nikon P-Series is another great value budget mount. It’s lighter in construction than either the Burris or the CCOP. Unlike the other two it is a two-piece construction so it can accommodate a wider variety of scopes. 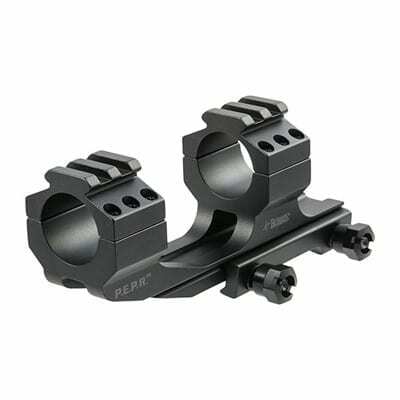 The two-piece design means this mount can accommodate a almost any length of scope in various configurations. 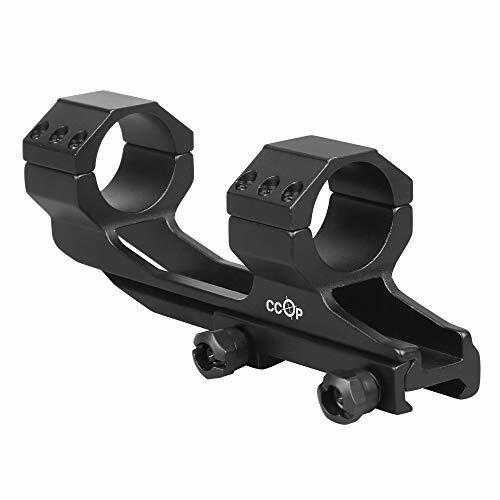 These scope mounts are a good indication of the types of options available on the market. They run the range from budget to expensive and show the sorts of features you can expect at that price point. None of the budget options will let you down. But even the more expensive brands show you the kind of bells and whistles you can expect to find as the price increases. Remember to consider durability, construction, features, and value when looking at any scope mount. You’ll end up with a great option that will last you a long time.